Do you have trouble understanding what one says if you’re in a noisy restaurant? How about when someone is calling from another room? Do you understand what is being said better if you can watch someone’s lips and mouth? If the answer is yes to one or more of these questions then you should get a hearing test. We are proud to provide a state-of-the-art, full service facility to accommodate nearly every type of hearing loss. When you come to Peak ENT or the Hearing & Balance Institute for hearing loss, you meet first with an audiologist who tests your hearing in a comprehensive fashion and also tests the mobility of your ear drum. Once testing is complete, you meet one of our physicians who would explain your type of hearing loss and could make recommendations specific to your needs. I have worked with a lot of hearing loss patients over the years. Hearing loss is much more common than most people realize. Gradual onset hearing loss occurring as you age affects 1 in 3 patients age 65-75 and over half of patients older than age 75 according to the National Institute of Health. This is most commonly thought to be due to hereditary factors as well as loud noise exposures, but sometimes simple blockages of the ear canal with wax, infections, or abnormalities of the ear anatomy can also be possible causes. 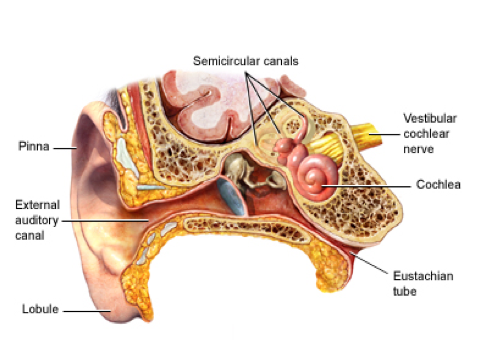 For normal hearing, sound must travel down the ear canal to the ear drum where sound is amplified through the bones of hearing into the cochlea. Once in the cochlea, small hair cells are stimulated by specific frequencies of sound. These hair cells then produce nervous signals that are sent to the brain, which interprets the sound. Hearing loss will occur when something goes wrong with any part of this system and can be further defined as either a conductive hearing loss or sensorineural hearing loss. . If you suspect hearing issues, don’t hesitate to schedule a consultation, and I’ll be happy to offer some solutions.